Making Low Carb Dinners has been easier than I thought. We have had a lot of food eating changes in our household due to health reasons. 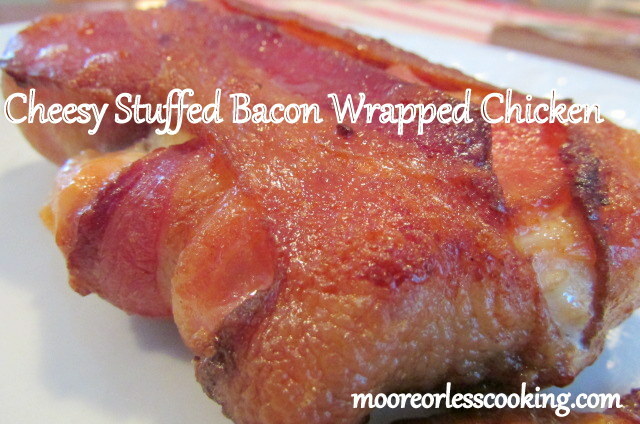 So I have been thinking about making something with bacon and thought a cheesy bacon wrapped chicken would taste great, and it really does! I stuffed the chicken breasts with Sharp Cheddar Cheese and Cream Cheese, Seasoning Salt and Oregano. Place chicken breasts in a large plastic bag, pound the chicken breasts with a kitchen mallet until they are flat, this tenderizes them. 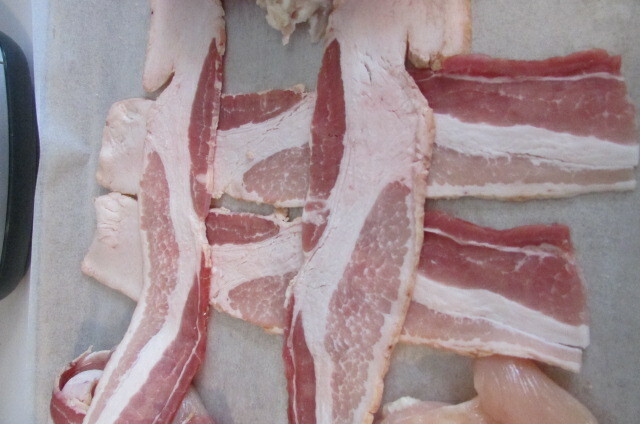 Cover a Baking sheet with parchment paper, lay two strips of bacon down, cross over with two more strips bacon. 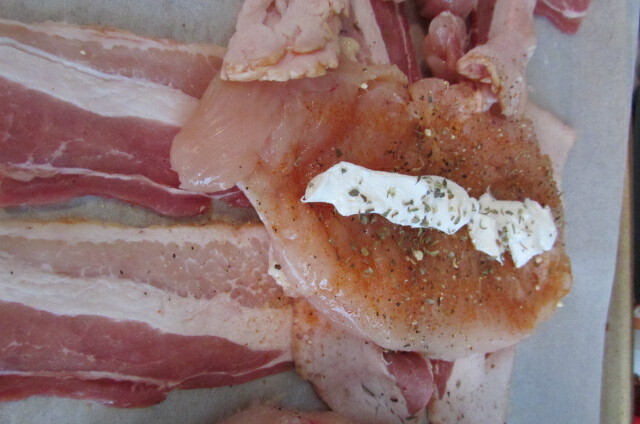 Lay chicken on top of bacon, spread cream cheese, and shredded cheese, seasoning salt and Oregano. 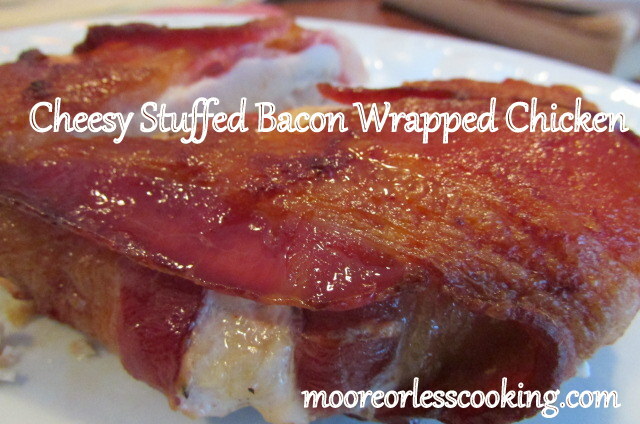 Fold the bacon over the chicken breast, place in oven at 375 degrees for 45 minutes. Turn halfway through the time. Place on broil until bacon is crispy. Keep a close eye, bacon can burn quickly. Serve with a veggie or salad! Cut each chicken breast in half so that you have 4 equal size pieces, then pound each piece until it is about a 1/4 inch thick. Mix together the softened cream cheese, herbs and shredded cheddar. Divide this mixture equally into the middle of each piece of chicken. One piece of bacon wrapped around each breast is enough, but 2 pieces of bacon for each breast fully wraps around the chicken and is outstanding. Place on a baking sheet/tray and bake for 30 minutes at 190 degrees C.
Crisp the top for about 5 minutes to fully brown and crisp bacon. Turn each breast over and crisp for another 3 minutes or so to crisp up the bottom side. Oh man that looks good Nettie! My hubby would LOVE it! Thank you Linda! It sure was popular, have to double the recipe next time!